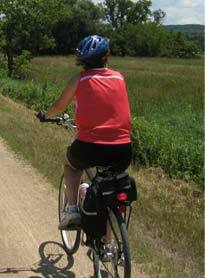 On Friday, we'll be riding from Kline Creek Farm in West Chicago to Villa Park via the Great Western Trail. We'll return via the Illinois Prairie Path, passing through Lombard, Glen Ellyn and Wheaton. If you can join us, meet at 9:15 to get bikes ready, sign in, etc; we'll depart at 9:30. We'll stop for a break at the Villa Park Historical Society, and probably again in Wheaton. Bring water, snacks, etc. If there is any need to cancel, I'll send an email by 7:00 am Friday. If you let me know you're coming, we'll be on the look-out for you.